The Human Process teaches the Yang-Style Short Form as developed by Cheng Man Ch'ing. 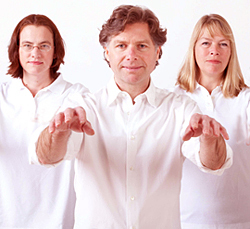 We use a unique method of teaching Tai Chi that retains the body-to-body transmission of the traditional 'master-student' interaction while presenting material in a modern, easy-to-follow way. Classes are team-taught and movements are broken down into small increments so that students learn more quickly. We offer Free Introductory classes in January, April, and September. In the Introductory class, students learn the first few moves of the form and are given the opportunity to experience the slow, relaxing movements of Tai Chi. Students are also welcome to attend any scheduled B1 Beginning class and take the first class for free. To be notified of upcoming Tai Chi intros, please fill out our program notification form.